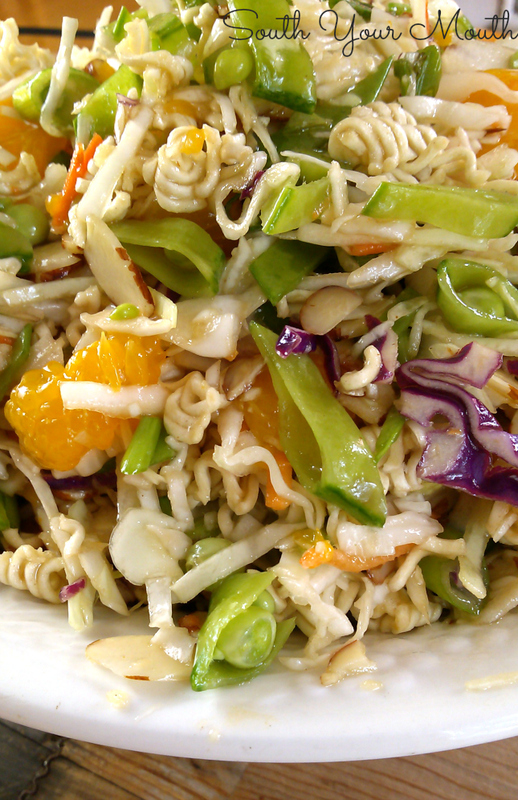 A crunchy Oriental salad recipe using coleslaw mix and ramen noodles! 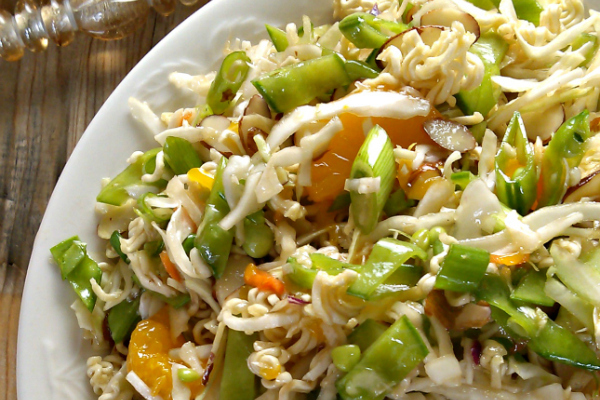 This retro Asian-inspired salad is always a hit! Remember this salad?! I used to get soooo excited when Mama would make this growing up because a) it was so delicious but, most importantly because, b) I totally thought it was something special and exotic! I was flipping through one of my old family cookbooks the other day and came across it and had to make it! There are 40'leven different versions of this salad floating around out there but this has always been my favorite. You can change up the veggies lots of ways but I think [and Mama agrees] you must, must, must get the oriental flavored ramen for this because the seasoning packet is what makes this version so special. I decided to add oranges to this batch but they’re not part of the original recipe – just use what you like! And pu-leeeeease don't yell at me about how fattening ramen is and how the flavor packets are full of sodium and dehydrated gargoyle tears and blah, blah, blah. Just because this recipe has ‘salad’ in the title doesn’t mean I’m implying it’s entirely healthy. IT TASTES DELICIOUS. Period. I haven't done it yet but I REALLY want to add grilled or sauteed shrimp or chicken to this and have it as an entree! 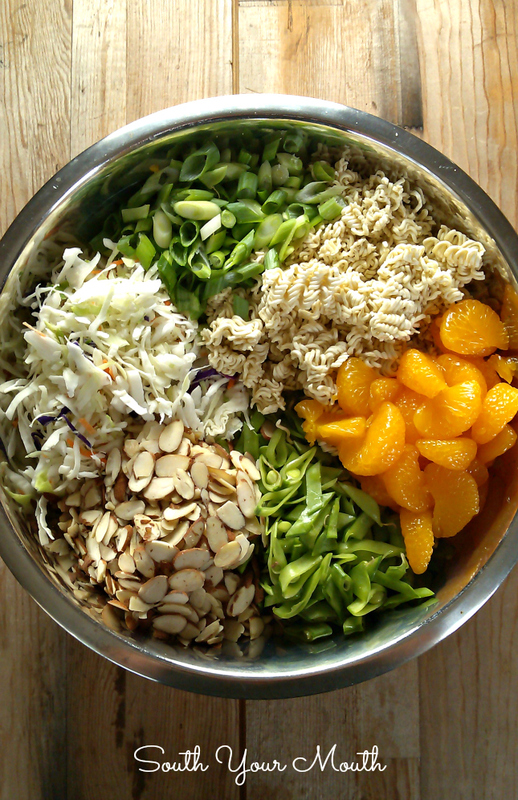 Combine coleslaw mix, snow peas (or edamame), scallions, mandarin oranges and almonds in a large bowl; set aside. In a separate bowl, combine vegetable oil, vinegar and sugar then whisk vigorously until well combined. Open ramen packages and remove the seasoning packets. Add the seasoning packets to the oil mixture and whisk until well combined. Cover dressing and refrigerate until ready to serve salad. When ready to serve, pour dressing over coleslaw mixture. Crumble uncooked ramen noodles then add to coleslaw mixture as well. Gently toss all ingredients until combined. Serve immediately. Wait to add the dressing and uncooked ramen until just before you’re ready to serve. You can substitute other nuts for the almonds – use what you like. I love this salad and its versatility. I use sunflower seeds instead of almonds. I agree with you on negative comments from the food police. I read through a recipe and decide if I want to make it. If not ---the solution is simple- don't make it! I LOVE this salad (my version, cuz I've not tried yours yet). I also use sunflower seeds and almonds and I toast them with the crumbled noodles till they are golden and scrumptious! If you haven't tried it, I highly suggest it! Can't wait to try this version! and toast the sesame seeds at the same time!! I said "OH! And I love you Mandy! I love your recipes!! Thank you! I've never heard of this dish before but it does sound interesting. In this day and age when plenty of Americans are without sufficient food, it drives me mad when people act like eating good food is a felony. 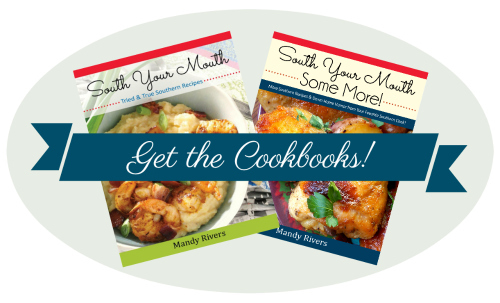 Thank you for your blog - I enjoy your recipes. Are you sure I can't make this in a crock pot? HAHAHAHA, I love your humor!!! well, you COULD make it in a crock pot, just don't turn it on!! I love this salad and Yeah I know ramen isn't good for you. Who cares it's only a little not everyday. I love this salad too. I think the version I had also had toasted sesame seeds and artichoke in it. 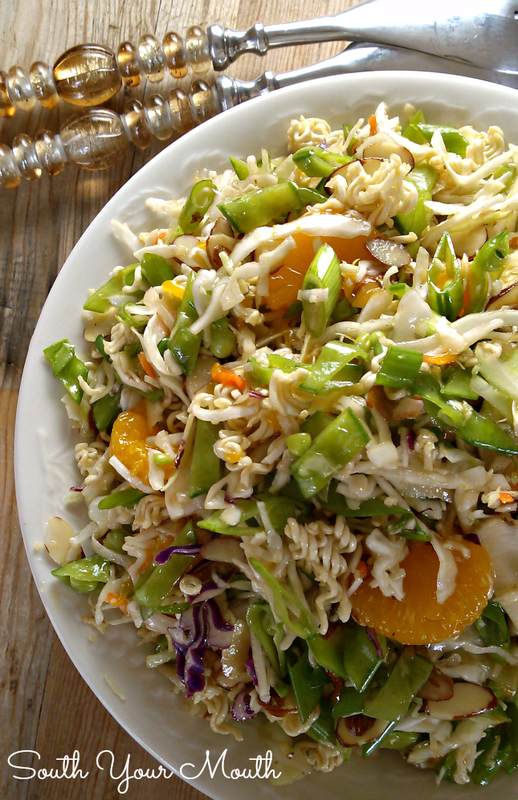 I have been using a pacaged fresh Asian salad, adding the mandarin oranges, honey glazed pecans and using the orange juice in the salad dressing pck. Sometimes I add chicken. Thanks for the recipe, I liked it a lot, but never had the actual recipe before. I plan to use some chopped chicken breast in this salad too, the next time I make it. I am gonna have to dig my recipe out of the archives now, I can't even begin to think how long it's been since I have made it. My sister used to make this! She added sesame oil, and toasted seeds! Love this salad! We roast the almonds and sunflower seeds with the noodles in it too. Since my mom and I are really the only 2 in our family that like it, we usually only make it for extended family gatherings when my aunts will be there to help us eat it. I love it right after its made, but its so good the day after as well. Thanks for sharing! can I use olive oil if I don't have vegetable oil? try coconut oil. Healthy and it adds a nice taste. This salad looks really delicious. Can I substitute another vegetable for the edamame or snow peas? I have an allergy to soy and my husband doesn't like snow peas? Thanks for all your wonderful recipes. I have made and enjoyed many. Sure, use whatever you like! I couldn't find the snow peas, which I wanted, so I made it without. I put both almonds and pecans and about 1/4 of a green bell pepper along with all the other ingredients listed. It was delicious. The dressing is perfect for it. This recipe made me look like a salad rockstar! Thanks for sharing! The only change I made was I toasted the almonds and ramen noodles at 350º for 10 minutes. Does anyone know what the "implied" serving size is? Has anyone used other seasoning other than the ramen noodle seasoning? I am on a low sodium diet, but this looks amazing! Спасибо за рецепт! Очень оригинально! I have made a similar salad using nappa cabbage. I love it but stopped making it because the nappa cabbage us hard to get and expensive where I live now. I never thought to use coleslaw mix!! Thank you so much!